The Painted Faces Series portray the changing perceptions of spirits and their significance in human culture. Nightfall Faces shadow the unnamed dark and light spirits of forest and bush. Primary Faces (pictured) represent the named, primal, ancestral spirits of the village. The rattle becomes the rattles of the masked and painted spirit dancers in the clan houses. Harlequin Faces celebrate the festive, carnival faces of town. Primary Faces, a painter‘s book, 3“ x 3”, 5 pages with concealed rattle plus packet wrap, acrylic on multilayered and cut papers, unique, $340. 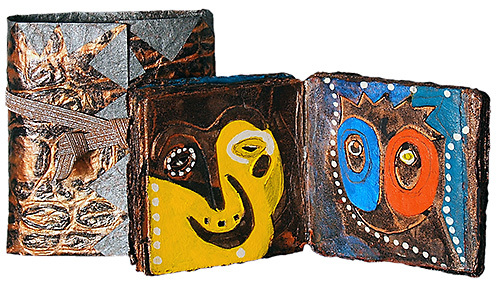 “Carolyn Leigh’s exuberant mixed-media structures are intensely colored panoramas of purposely primitive figures and streetscapes.” -- Karen Jones, The Book: WIDE OPEN!